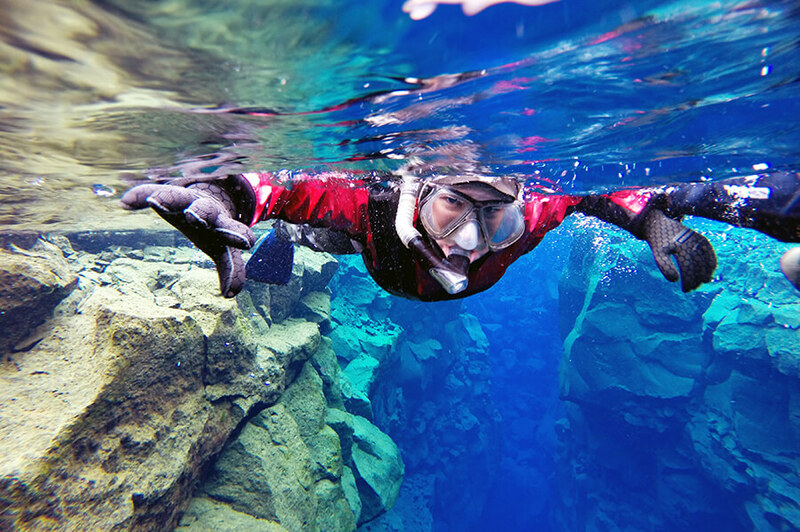 Snorkel in Iceland at one of the top dive sites in the world, situated in Thingvellir National Park, only about 50 kilometers from Reykjavik. 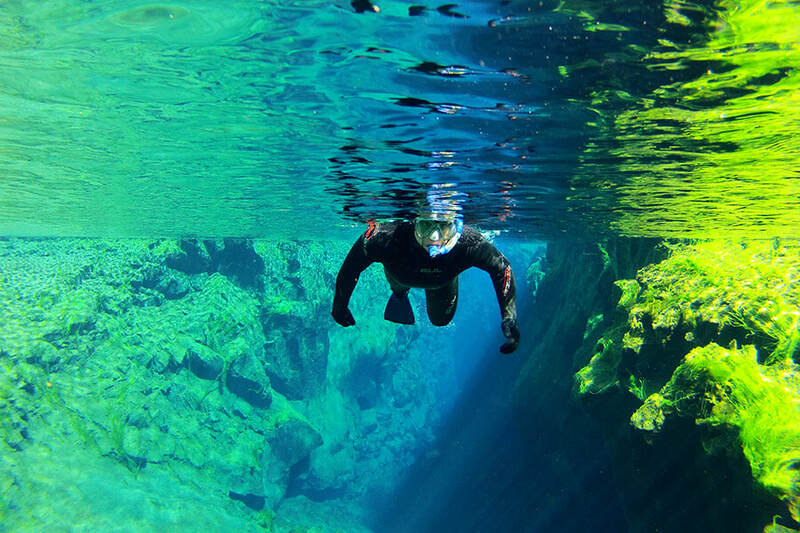 Silfra fissure exists due to the North American and Eurasian tectonic plates separating around 2 centimeters a year – leaving a rift in the landscape between them. 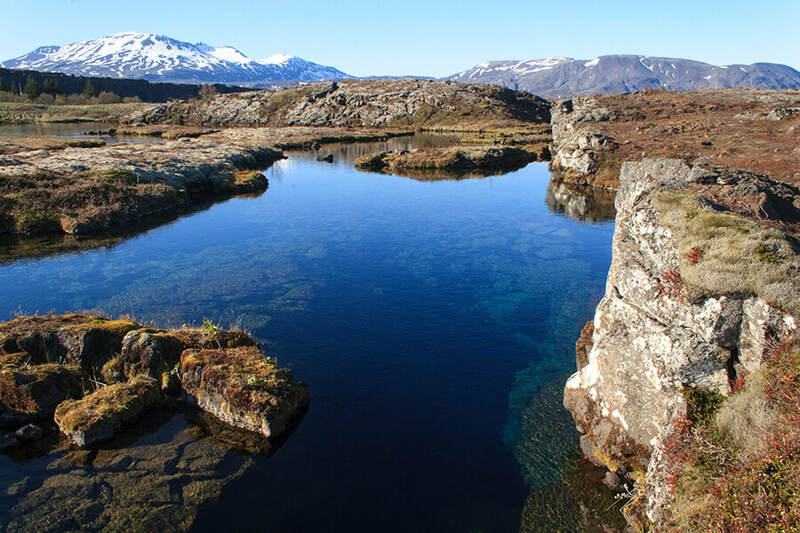 This rift is filled with glacial water from Langjökull glacier that has been filtered through lava fields for decades before reaching Silfra – making the water exceptionally clear and drinkable. Make sure you taste it while you glide through the fissure between two continents – there is nothing quite like crystal clear glacial water. Experience the incredible visibility exceeding 100 meters, along with the breathtaking dramatic sights as rays of sunlight stretches its arms through the pristine waters, touching the rocks and algae growing on the walls of the canyon. Or watch as the snowflakes melt on top of the still, see-through water on a cold, crisp winter day. Wearing a dry-suit makes snorkeling in 2-4 degree Celsius (35 degree Fahrenheit) water achievable – without experiencing the cold. With a thermal undergarment and the protection of the dry-suit, you manage to stay dry and warm. Please note that this is the meeting time at Thingvellir, Silfra car park – Pick up from your hotel starts 75 minutes earlier. If you do not require pick up, the meeting point is Silfra car park in Thingvellir National Park. Please park your car at “Thingvellir P5” and walk 400m back along the road until you reach a smaller car park with all the snorkel and dive vans, and look for your Adventure Vikings guide. Please be there, ready to meet your guide 5-10 minutes before your tour is due to begin. GoPro – 6900 kr ISK. Rent a GoPro and you will receive an SD card with your footage to take home straight after your tour. ​Payment is due in full upon booking. Up to 48 hours prior to the tour departure time, 90% will be refunded. Within 48 hours of the tour departure time, no refund is available.